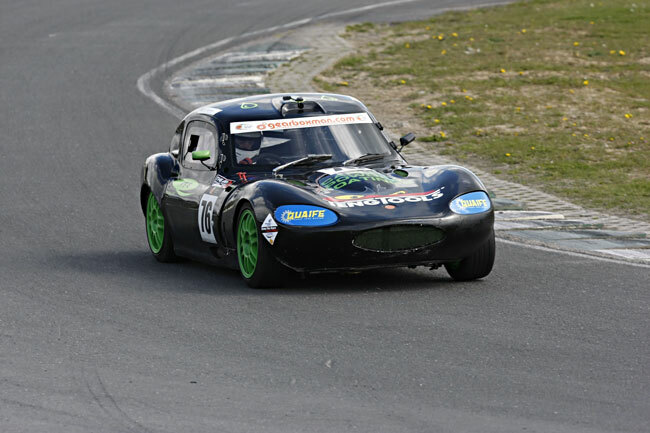 The 2012 Ginetta Junior Ireland championship in proud association with Quaife, gearboxman.com, thegrid.ie and Michelin resumed after its mid-season break allowing exam students plenty of time to focus on their exams. Championship leader Jake Byrne was one of those who completed his Leaving Certificate and was keen to pick up where he left off with another strong weekend to extend his championship lead. However early season pace setter James Fleming was hoping to dampen Byrne’s parade and grab a strong finish himself to re-ignite his championship challenge. Murray Motorsport’s Andrew Clarke was another driver looking to grab his first win in the championship. The young Dubliner has been a regular on the podium of late and his time on the top step is certainly not far away. In qualifying it was Fleming who set the early bench mark to take pole position for race one. Jake Byrne was just three tenths back in second followed closely by championship rookie Dylan Curly driving the ex-Andy O’Brien 2011 Championship winning G20. Andrew Clarke posted the fourth fastest time with ABR team mates Jack Finlay and Sophie Byrne rounding out the top six. Off the line in race one it was Byrne who got the best start as Fleming missed a gear as he pulled away from the top spot. At the end of the first lap Byrne had a good lead followed by Curley, Clarke and a recovering Fleming. However Fleming’s woes were not over as a spin coming out of Dunlop corner left him back down the order having recovered to third. Curley and Clarke were now back up to second and third respectively and locked in battle for position. As the chequered flag dropped it was Byrne who took a dominant win ahead of a season best result for Dylan Curley. Andrew Clarke took the final step on the podium in third followed by Jack Finlay taking a very strong fourth. Sophie Byrne in her qwerky black and pink Ginetta took a strong finish in fifth with another championship rookie James Huddleston rounding out the top six. In race two it was Jake Byrne who lead away from pole position followed by Jack Finlay and Andrew Clarke. James Fleming starting from the back of the grid was keen to make up for a non-finish in race one to try and keep his championship challenge alive from run away leader Byrne. In the early stages of the race the red flags were brought out as Dylan Curley went off coming out of turn two. On the restart it was Byrne who yet again got the best start off the line to lead. Very quickly Fleming was up 2nd but Byrne had already opened a slender lead. Jack Finlay and Andrew Clarke were battling hard for the final podium position. Out in front however nobody could deny Jake Byrne his second victory of the day. Following him across the line after a difficult weekend was James Fleming in second. Andrew Clarke grabbed himself another third place finish followed closely by an ABR trio of Jack Finlay, Sophie Byrne and James Huddleston. The next rounds of the Ginetta Junior Ireland championship return to Mondello Park on Saturday 21st & Sunday 22nd July.